Use Cold-Sinus to relieve symptoms of the common cold such as a runny nose, tearing eyes, feelings of distress, dry and stuffy sinuses, post-nasal drip, and sinus pressure and pain. It will help with a fever as well if the cold is an acute attack of a cold virus. 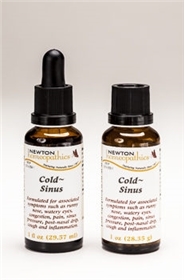 For sinusitis, the Cold-Sinus is safe for daily long-term use. DIRECTIONS: At the beginning of symptoms, take 3 to 6 drops on the tongue several times a day or even every hour. If a cough persists after the other cold symptoms are gone, take a dose of Cough-Asthma complex approximately every hour. If the respiratory symptoms are allergy related, one of the following complexes might also behelpful: Hay Fever, Pollen & Weeds, Dust, Mold, & Animal Dander, or Dairy, Grain, & Nightshades. INGREDIENTS: Arsenicum album, Bryonia alba, Gelsemium sempervirens, Hepar sulphuris, Kali bichromicum, Mercurius vivus, Phosphorus, Pulsatilla, Rhus toxicodendron, Sabadilla, Sticta pulmonaria 15x. Histaminum hydrochloricum 12x. Echinacea purpurea, Aralia quinquefolia(Ginseng), Gaultheria procumbens, Salvia officinalis, Verbascum thapsus 3x. Alcohol 20%.